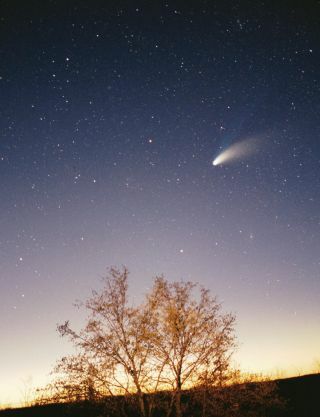 Comets like Hale Bopp, seen here, can release dust that can make its way into Earth's stratosphere, where we can collect and study it. Scientists are following a trail of interstellar dust all the way back to the formation of the solar system. What we now know as the solar system began as a cloud of interstellar dust and gas. By studying "pre-solar" dust, which was preserved in cosmic objects like comets before they made their way to Earth, scientists can peer back in time to the early solar system. An illustration of the early solar system, which leading theories suggest formed from a molecular cloud of interstellar dust and gas. These dust particles contain tiny grains of glass with embedded metal and sulfides, or GEMS, according to a statement. The team's work suggests that these bits of dust are a relic of the pre-solar days. Scientists have been studying GEMS for years, but this team has found compelling evidence that these grains survived the original building phase of our solar system. Using transmission electron microscopy, a technique in which electrons are beamed through a specimen to create an image, the researchers have mapped how different elements are distributed in GEMS. Through this process, they discovered that GEMS are made of smaller "sub-grains" that formed before their comet parent; therefore, before our solar system first developed. With these observations, the researchers think that GEMS could "represent surviving pre-solar interstellar dust that formed the very building blocks of planets and stars," Ishii said in the statement. GEMS are usually smaller than 1/100th of the thickness of a single human hair, with a diameter measuring only tens to hundreds of nanometers, according to the statement. Additionally, GEMS are made up of "sub-grains," which are surrounded by different types of carbon. The researchers found that these types of carbon decompose with relatively low heat, according to the statement. Because of this, the researchers think that this dust, and its parent comet, couldn't have come from the hot, inner solar nebula. Astrophotographer Chris Chur captured this view of comet C/2016 R2 (PANSTARRS). Interstellar dust from comets could help us to better understand how the solar system formed. Instead, they think the dust more likely formed in a farther, colder, radiation-rich location, such as an outer solar nebula or even a pre-solar molecular cloud, according to the statement. So, despite their miniscule size, these glassy dust bits have survived some extreme interstellar conditions. By studying "the starting materials of planet formation from 4.6 billion years ago," we might gain "a deeper understanding of the processes that formed and have since altered them," Ishii said in the statement. Following this research, the team will explore additional comet dust to better understand the composition of GEMS and the size of the sub-grains, according to the statement. The research was detailed yesterday (June 11) in the journal Proceedings of the National Academy of Sciences.